Google Spreadsheet is one handy app to create and share your spreadsheet on the cloud. Being an online webapp there are endless possibilities for the tasks that you can do with it. Here are some of the tricks that will help you do get more tasks done with the spreadsheet. 1. Select your row or column which you wish to turn into heatmap. 2. Go to Format menu > Conditional formatting. 3. Check the conditional formatting values. 4. Select the minpoint, midpoint and maxpoint values for your data. 5. Adjust the midpoint to percentile. 6. Click on Done button. Depending on the data you can adjust the rules accordingly. This simple trick can make your data easy to view and you can focus on important numbers within your tables. You can set the localization option within your spreadsheet. Once you set that option, you can make use of currency symbols and other locale options within the spreadsheet. Follow the steps below for making that change. 1. Go to File menu. 2. Select "Spreadsheet Settings" and set the access level for collaborators. 3. Go to document settings. 4. Change the language and time zone. This should make the language and region specific changes in your document. Localization can be helpful when you're making use of the local currency and time format for your documents. Google spreadsheet allows you to protect individual cells. You can also protect entire sheet and disallow others from editing anything at all. Do note that when you set the collaborators privately then in such case only those are allowed to edit. However when you make spreadsheet disabled for editing then nobody except the document owner can edit it. Follow the steps below to protect your document. 1. Select the cells that you wish to protect. 2. Open right click menu. 3. Choose name and protect range. 4. Select the protect checkbox. 5. Choose the range of cells or entire document. 6. Set collaborators options to "View only". This should protect both your spreadsheet and the cells inside the sheet. 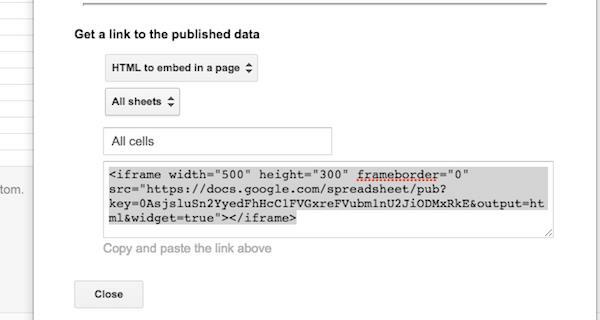 You can embed the Google Spreadsheet inside any HTML page. Follow the steps below to embed the document inside HTML page. 2. Click on option - "Publish on the web". 3. Chck the option - "Automatically republish when changes are made". 4. Click on Embed tab. 5. Copy and paste the IFRAME HTML code into your webpage. This process will help you embed the spreadsheet inside your HTML document. If you work with the live data for stocks or currency then it helps if you fetch the RSS feed. In such case you should definitely check this feature out. Follow the steps below on how to do just that. 2. Type the following formula inside the cell. 3. Replace the "feed URL" with the RSS feed URL for the data that you wish to import inside the cell. 4. Hit enter and Save the spreadsheet. This formula should help you get the content from the RSS feed or even from Wikipedia. You can import images from external websites. All you have to do is use the image function inside the cell. This should import and save the image inside your spreadsheet document. Follow the steps below to import images. 2. Select the cell where you wish to import the image. 3. Add the following formula. Replace the URL with image URL. You can use this feature for web scraping or other data collection purpose. 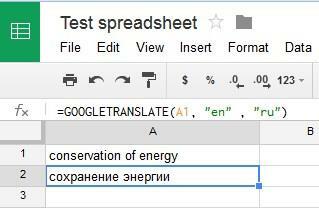 Google Spreadsheet can access Translate API for translation within the sheet. Follow the steps below to translate the content from the cell. 1. Select the cell where you have content to be translated. Let's assume it is cell A1. 2. Type the formula in the formula tab to translate the cell A1. 3. Choose the source and target language. e.g 'Es" for Spanish language as source language. "En" for target language. This process will translate your content from one language to another. You can import the website tables from other external sites. All you have to do is use the import HTML function. Follow the instructions below to import data from other website. 1. Select the cell where you wish to import data. 2. Type the following formula. Here URL should be replaced by the name of website. Table should be replaced by the name of table. And the number should point to which table. 3. Save the formula and hit enter. This should import data from any website from which you want to copy table data. 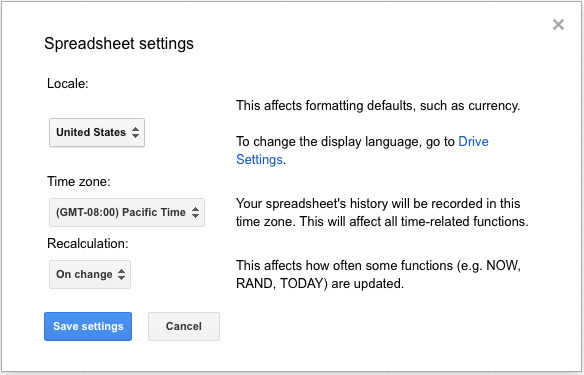 Google Spreadsheet has plenty of features that can help replace your desktop work processor. The above listed tips can help you get your tasks done quickly and be more productive in your work.